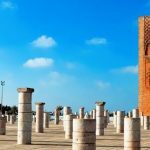 Here is an example of 6 days Tour of the new year eve tour in Morocco Sahara desert or you can check the other options below. 28th December: Marrakech » Tizi N’Tichka Pass » Aït BenHaddou » Ouarzazate. Today, Meeting you at your hotel; we will pick up you and drive toward Ouarzazate across the Tizi N’Tichka Pass (2260 meters).Stopping along the way for photos and enjoying the panoramic views of High Atlas Mountains along with Berber villages located alongside the road. You will also have a break for lunch on the way. Later on, continuing to the village of Aït Benhaddou where you visit the exotic Kasbah named after it. This Kasbah is situated on a hill along the fertile Ounila River; it becomes famous due to its role in hosting numerous films such as: The Man Who Would Be King, Jewel of the Nile, Jesus of Nazareth, The Message, Lawrence of Arabia, The Mummy, and Gladiator. 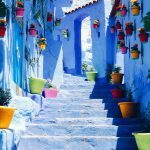 From here we head to Ouarzazate city where you may visit the Atlas films Studios and stopping to view the Kasbah of Taourirt. 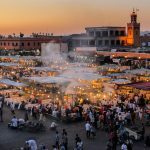 Dinner and overnight at a hotel in Ouarzazate. 29th December: Ouarzazate » Skoura » El-Kelaâ M’Gouna » Boumalne du Dadès »Tineghir »Todra Gorge. After breakfast at the hotel, you will depart toward Todra Gorges. You will visit the incredible Kasbah of Amerhidil located in Skoura Oasis where you will be mesmerised with the immense Palm Groves and beautiful sights of the Atlas Mountains. Continuing on to El Kelaa M’gouna (Valley of the Roses) and stopping for lunch. Later on, leave for the final destination Todra gorges passing by Dadès Valley (Valley of One Thousand Kasbahs),Boumalne and Tinghir .You will have the chance to stop for a panoramic view of the river. Continuing on the road alongside the river to reach the gorges where you will spend the night. Dinner and overnight in hotel alongside Todra River. 30th December: Todra Gorges » Tinejdad » Erfoud » Merzouga. Today, after breakfast you will walk/hike on foot to explore the surrounding area of beautiful gorges while enjoying the views of high rock walls (up to 300 meters). From here we leave to Tinjdad where you can have lunch then drive to Merzouga passing by Erfoud. You will view the Khatarat (Canal irrigation system) on our route.You may have a stop in Erfoud to visit one of the marble fossils Carriers before continuing to your hotel situated on the foot of the orange dunes of Erg Chebbi. 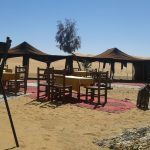 Near Your Hotel, you will mount your Camel to reach the desert camp in the Oasis inside the dunes where you will spend the night, view the sunset, dine under the stars and sleep under Nomad Berber tent. 31st December: Merzouga » New Year’s Eve Celebration. Waking up by the call of your guide very earlier to witness the sunrise then enjoying breakfast. 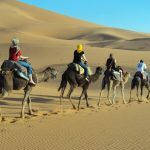 You will trek back to your hotel where you can have hot shower and get ready for the excursion around Erg Chebbi dunes.This excursion gives you the opportunity to explore the surrounding desert by visiting the tiny villages and fossil Carrier in addition to nomad Family. Back to your hotel for lunch and relax. This Afternoon at your leisure. Tonight you will enjoy the party of New Year’s Eve in Sahara Desert, dinner and a few drinks, enjoy local drum music, sing and dance. Overnight in the Hotel. 1st January: Merzouga » Rissani » Erfoud » Er-Rachidia » Midelt. This morning is spent at leisure; you can check into the hotel and relax or go and explore the surrounding of your Hotel. After lunch we will travel to Midelt via Rissani,Erfoud,Erachidia,Rich, Tizi N’Talghom Pass (1907m). 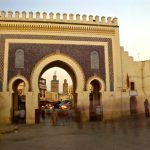 You will have a short visit to Zawiya Moulay Ali ash-Sharif; you may also wander in the souk of Rissani. Continuing on our drive toward Errachidia, our next stop is at the panoramic view of Aoufous Oasis. Later on, you will pass by Errachidia known as the military city due to its numerous garrisons. We May stop at Barrage Hassan Adakhil for photos. In continuation alongside Ziz River, You will enjoy the beautiful scenes of the Ksours and Ziz gorges, you will pass by the French built Tunnel Du Légionnaire( Zaabal).The trip continues through the middle atlas, you will cross Tizi N’Talghom Pass.Arrive to Midelt. Overnight in a Hotel. 2nd January: Midelt » Azrou » Ifran » Fes. After breakfast, you will enjoy the great views of Jebel Aachi Mountain with snow-covered peaks. 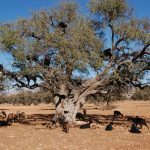 Leaving Midelt toward Azrou where you will have your lunch and exploring this Berber city .Later on, you will have to the chance to view the old tree and meet the monkies in cedar forest. From here we head to Ifran “The Moroccan Switzerland», you will see the stone lion and take picture with it. You may have a visit to Al-khawayn (Two Brothers) University .Continuing on our drive To Fes passing by Imouzar Kander. Arrive to Fes and transfer to the hotel of your choice. Here is a selection of routes and itineraries available for the New Years Desert Tours of 4days / 3nights and 5 days / 4 nights that depart from Marrakech to Marrakesh or Fes to Marrakech and vice versa. The scheduled departure of these trips will allow you to experience a camel trek at Erg Chebbi and spend the night in a camp made of traditional nomad tents .it will also allow you to celebrate the New Year in the Sahara desert of Morocco, in the middle of nowhere under a starry sky. Please pick up the one that best suits your time travel and get more details about it along with a quote based on the number of persons in your party. 30th December: Marrakech to Boumalne du Dades across the pass of Tizi Tichka (2260m). 31st December: Boumalne du Dades to Erg Chebbi, Merzouga: Sunset Camel Trek & New Year Party. 1st January: Erg Chebbi to Ouarzazate via Rissani, Agdez . 2nd January: Ouarzazate to Marrakech via Ait Benhaddou & Pass of Tizi Tichka (2260m). 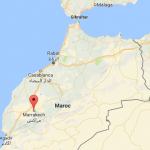 29th December: Marrakech to Ouarzazate across the Pass of Tizi Tichka (2260m). 31st December: Todra Gorges to Erg Chebbi, Merzouga: Sunset Camel Trek & New Year Party. 1st January: Erg Chebbi to Agdez via Rissani and N’kob. 2nd January: Agdez to Marrakech via Ouazazate, Ait Benhaddou & Pass of Tizi Tichka (2260m). 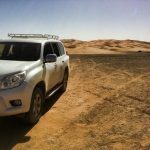 1st January: Tour around the dunes of erg chebbi in 4×4. 2nd January: Erg Chebbi to Fes via Rissani, Ziz Valley, Cedar Forests and Ifrane. 1st January: Erg Chebbi to Boumalne du Dades via Todra Gorges. 2nd January: Boumalne du Dades to Marrakech via Ait Benhaddou & Pass of Tizi Tichka (2260m). 1st January: Erg Chebbi Dunes to Todra Gorges. 2nd January: Todra Gorges to Ouarzazate via Boumalne Nomad Cave trail and Skoura. 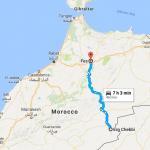 3rd January: Ouarzazate to Marrakech via Ait Benhaddou & Pass of Tizi Tichka (2260m).